I found this month's Lost Chapter to be pretty interesting with a focus on what makes a miniature game a hit-or-miss, though it seems like the beginning of a full episode that could examine why games you loved and reviewed positively either died or just showed up dead in the water. 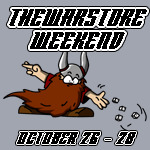 It's an interesting topic on its own, and because I'd love to hear both Craig and Russ' comments on FFG "finally" releasing a new house for Battles of Westeros. Outside of that, the new intro/outro music is a strange fit. The old song seemed perfect as it oozed machismo, the new one sounds like it should be the opening for Zorba Paster, who doesn't seem manly enough to play with inarticulate dolls! Two things on this episode...first, I kept saying to myself, "Episode 75? Did I miss something?" --found it kind of strange that this was posted before the episode it responded to! So maybe the second thing is buried in Episode 75: I seem to recall that Hollywood started to try "Ravenloft" with his son after doing a slimmed down (?) version of "Descent". Russ is doing "Ravenloft" with one of his daughter's. As a dad who is looking to "ease" his daughter (11 YO) into gaming, I was hoping that would be part of the discussion in this lost episode (although maybe it is inside the mysterious Episode 75!). well the commentabove, by me, that was submitted before book 4 was released, was intended for book 3. I have downloaded and listened to book 4 and have to say you guys are now 4 for 4. Another great discussion and well worth the money!! I actually didn't have a lot of interest in the subject of this week's, but I still enjoyed it immensely. You guys do a great job in conversational interaction, and you make everything entertainin. 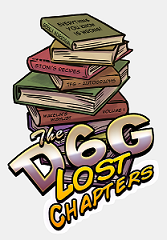 D6G are 3 for 3 with the Lost Chapters... Keep up the great work! !